UPDATED: Wed., June 28, 2017, 10:14 p.m.
A barometer of aquatic health, redband trout require clean water to survive. Washington Department of Fish and Wildlife considers the fish a sentinel species. Small remnant populations are found throughout the Pacific Northwest and in British Columbia. 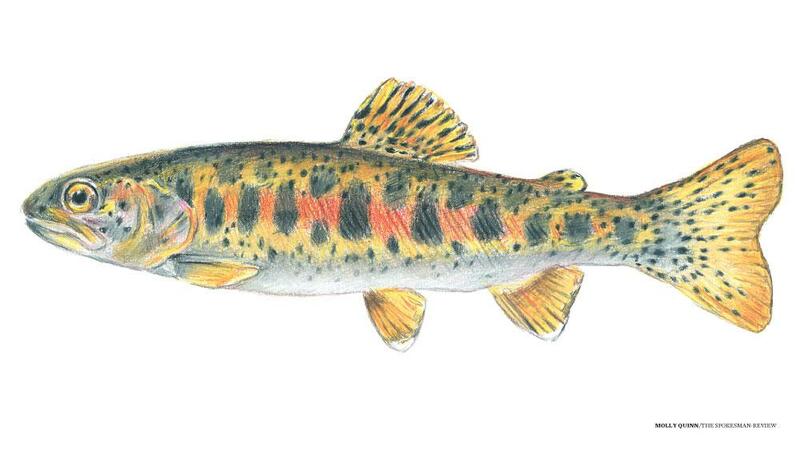 Redband trout are classified as a sensitive species by the USDA, Forest Service and USDI Bureau of Land Management. As of Jan. 1, 2017, the rules apply to native redband trout on Lake Roosevelt and the Spokane and Sanpoil arms. Must release any trout with an intact adipose fin (hatchery trout have a clipped fin). Daily catch limit is five trout not including kokanee. No limit on how many fish may exceed 20 inches. From Little Dalles power line crossing to the U.S.-Canada border the daily catch limit is two trout, hatchery or wild, and the minimum size is 18 inches. While recent years have seen the city of Spokane’s pulse pick up, time has not been so kind to its signature fish. The redband trout – named for the speckled black and red bands that brilliantly flash down its sides as it dances vigorously on the end of a fishing line – isn’t considered an endangered or threatened species, though some conservation groups argue it should be. Native to the more than 250,000 square miles that make up the Columbia River basin, the redband can only be found in about half of what is believed to be its historic range. Though there is some academic controversy over how to categorize and evaluate the health of redband populations, studies have agreed the introduction of invasive species, the fragmentation of the redband’s habitat by man-made creations, like dams, and climate change all present challenges. Brent Nichols, the fisheries program manager for the Spokane Tribe, said his data show that local redband populations have been stable over the past decade, but that means there’s been no growth. Many factors, like water quality, sediment or temperature, can impact a population’s health. The Washington Department of Fish and Wildlife considers the redband a “sentinel” species, acting as a measure of a river’s aquatic health. But Nichols said his team theorized that anglers were taking breeding pairs out of the ecosystem, ultimately impacting the population’s ability to grow. The tribal hatchery releases about 150,000 captive trout, of a coastal variety chosen to prevent integration with the wild native fish, intended for recreational fishing, Nichols said. Bill Abrahamse, Spokane Falls chapter president of Trout Unlimited, said he hopes to find out why the Spokane River’s redband population struggles while others continue to grow. “In the Spokane River, there are maybe 300 redbands per mile,” he said, noting that some streams in Idaho have as many as 3,000. Abrahamse said his group would like to work with WDFW to study what is limiting the redband in the river. 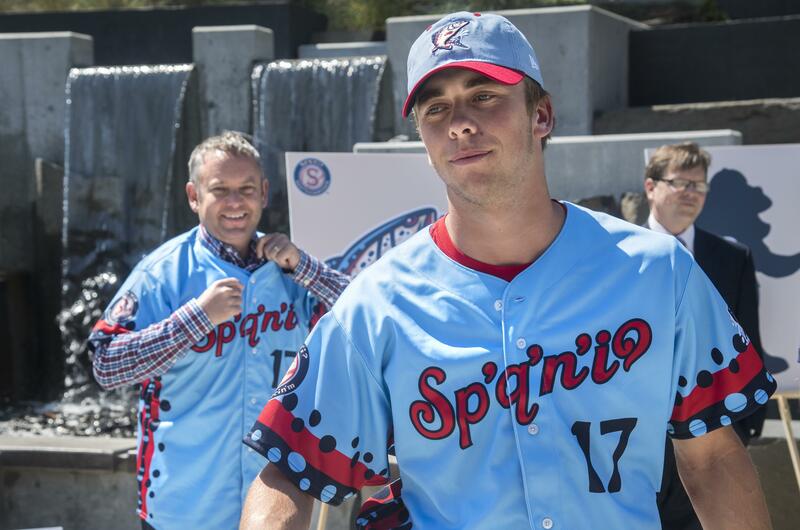 Recently, the department has worked to provide technical information to the Spokane Indians baseball club ahead of its coming redband awareness campaign. Trout Unlimited, which Abrahamse described as a group of conservation-minded fishermen, said people love to fish for the redband because of the fight it can put up once hooked, for its beauty, and because “it’s special when you catch one since there aren’t many.” But more than that, Abrahamse said people are drawn to the experience of fishing down on the river the redband calls home. “Fishing on the river … once you get down there, you can’t even tell you’re in an urban area,” he said. Department of Fish and Wildlife regional fisheries manager Chris Donley agreed with Abrahamse, noting that it is unique to have a native species like the redband make its home in the heart of a city’s downtown. He said people often forget there are organisms living in the river not far from the city pavement. Published: June 28, 2017, 5:48 p.m. Updated: June 28, 2017, 10:14 p.m.